India's first nuclear armed ballistic missile submarine completing final trials. The Arihant means India will join the U.S., Russia and China as the only countries that can target enemies with nuclear weapons delivered by land, air or sea. Fear is China might help North Korea, Pakistan develop similar capabilities, and that South China Sea friction will increase. India is close to becoming the world’s sixth country to put a nuclear-armed submarine into operation, a move that would give it a leg up on neighboring Pakistan and intensify a race for more underwater weapons in Asia. The 6,000-ton Arihant, developed over the past three decades under a secret government program, is completing its final trials in the Bay of Bengal, according to a senior navy officer who declined to be identified because he’s not authorized to speak about the program. The vessel will be operated by the navy yet remain under the direct control of India’s Nuclear Command Authority headed by Prime Minister Narendra Modi. The deployment would complete India’s nuclear triad, allowing it to deliver atomic weapons from land, sea and air. Only the U.S. and Russia are considered full-fledged nuclear triad powers now, with China and India’s capabilities still largely untested. India’s move may prod China to bolster its undersea arsenal and assist nuclear-armed allies Pakistan and North Korea in developing similar technologies. That risks potentially more dangerous altercations in Asia’s waters, where territorial disputes have contributed to a region-wide naval buildup. "You will probably see more friction in maritime sub-regions such as the South China Sea or the Bay of Bengal, which China and India increasingly view as their future bastions" for nuclear ballistic-missile submarines, said Iskander Rehman, a postdoctoral fellow at the Washington-based Brookings Institution’s foreign policy program. "Tensions will no doubt arise from subsurface encounters in such areas, particularly as both conventional and nuclear submarines continue to proliferate throughout the Indo-Pacific region." On Nov. 25, the Arihant reportedly test-fired a training missile, the Indo-Asian News Service reported, citing officials it didn’t identify. Defense spokesman Nitin Wakankar didn’t respond to questions seeking comment on the submarine’s deployment or the test. outbreak of war by discouraging enemies from attacking. Ballistic-missile submarines are considered to have played such a deterrent role in the Cold War. The U.S., UK, France, Russia and most recently China now have nuclear-armed submarines in operation. The 110-meter long Arihant would be harder to detect than India’s nuclear weapons on land and air, giving it a "second-strike" capability to retaliate powerfully against an enemy who managed to destroy the rest of the arsenal. China began combat patrols of an armed nuclear-powered submarine last year, the Washington Times reported in December, citing the U.S. Strategic Command and Defense Intelligence Agency. While China hasn’t made a formal announcement, and U.S. officials haven’t confirmed that nuclear-tipped JL-2 missiles were on board the submarines conducting patrols, they have no evidence that the vessels weren’t armed. "Given China’s known capabilities and their efforts to develop a sea-based deterrent, in absence of indicators to the contrary, it is prudent to assume that patrols are occurring," Navy Capt. Pamela Kunze, a spokeswoman for the Strategic Command, told the Washington Times. Even so, neither India nor China has quite reached the technical prowess to give them a credible nuclear deterrent. Their submarines are loud and easily detected, making them an unlikely second-strike asset, the Lowy Institute for International Policy said in a September report. Potentially more worrisome is that neither Pakistan nor North Korea subscribe to a no-first-use policy, and there are signs that both nations are pursuing cruder methods of deploying nukes at sea. Last year, Pakistan finalized a deal to buy eight Chinese conventional submarines, raising concerns that they could be equipped with riskier nuclear-tipped cruise missiles. North Korea also claimed to have tested a submarine-launched missile and said that it had developed technology to mount a nuclear warhead on a missile. "There will likely be a long phase of initial instability as China and India start deploying nuclear missiles on submarines," the Lowy report said. "Chinese and Indian nuclear-armed submarines – along with possible Pakistani and North Korean units – may remain detectable by adversaries, making their activities unpredictable in times of crisis. Moreover, these supposedly stabilizing new forces may worsen wider maritime tensions." China boasts at least 62 submarines, including four capable of firing nuclear ballistic missiles, according to the Pentagon. China’s construction of artificial islands, radar facilities and runways in the South China Sea may be aimed at using the territory as a base for its nuclear ballistic missile submarine fleet, the Lowy report said. The Arihant will be India’s first nuclear-powered and armed vessel that has been designed and built at home. The country is believed to have begun work on it in the 1980s with help from the Soviet Union, particularly on the vessel’s miniaturized reactors. In 2012, India also leased a nuclear-powered submarine from Russia under a 10-year, $1 billion contract. The two countries are negotiating a deal to lease another one, the Pioneer reported this month, citing Alexander M. Kadakin, Russia’s ambassador in New Delhi. Despite numerous setbacks, India is making progress on developing the weapons to arm the undersea vessels. In 2013, India test-fired an underwater ballistic missile with a range of 750 kilometers, the Hindu reported, citing an unidentified scientific adviser to the defense minister. Last September, India’s Defense Research and Development Organization publicly acknowledged having readied a submarine-launched ballistic missile with a 3,500-kilometer range at an awards event for military scientists attended by Modi. India needs to show the world it can capably and effectively operate the nuclear-armed submarine, said Jon Grevatt, Asia-Pacific defense-industry analyst for IHS Jane’s. The “important milestone" is part of a bigger strategy to ensure its security, he said. "The Arihant is a stepping stone for India," he said. "I don’t think it will alter the balance of power in the region unless India has a fleet of four or five such submarines." Though 30 Virginia-class subs are projected, more are anticipated. The Navy's Pacific Commander says the service cannot get new Virginia-Class attack submarines fast enough. Early discussions about increasing production of Tomahawk-armed Virginia-Class submarines are underway as the Navy and lawmakers look for ways to more quickly deliver new high-tech attack submarines to the force, Congressional sources told Scout Warrior. The discussions, involving lawmakers and senior members of the Navy, are still very preliminary and in the early stages. The possibility being considered includes the prospect of building more Virginia-Class submarines per year – instead of the amount called for by the current ship-building plan. The current status-quo effort to build two Virginia-Class boat per year, however, will drop to one as construction of the Ohio Replacement Program, or ORP, begins in the early 2020s. The possibility now being deliberated is whether, at this future point in time, the Navy and industry could produce two Virginia-Class boats and one Ohio Replacement submarine per year, increasing the current plan by one Virginia-Class boat per year. Increasing production hinges on whether the submarine-building industry has the capacity to move up to three submarines per year, the Congressional source said. Current budget constraints and industrial base capacity limitations may make building three submarines per year too difficult to accomplish, even if the desire to do so was there from both Congressional and Navy leaders. While Navy officials, including Navy Acquisition Executive Sean Stackley, did tell lawmakers on the House Armed Services Committee Sea Power and Projection Force Subcommittee, production changes could emerge in the future, depending upon funding and industrial base capabilities. Stackley explained that the service would like to maintain a two per-year production schedule for Virginia-Class attack submarines, even after production of the ORP begins. “We are working today, and we hope and expect you to work with us, to determine how can we keep two Virginias a year proceeding within all the fiscal constraints and within the limitations of the industrial base, to address this compelling requirement for the nation," Stackley told lawmakers. In the past, various sub-building industry executives have indicated that this might be possible, however such a prospect has not yet been formally confirmed as it would likely involve an increase in resources, funds and man-power. One industry source told Scout Warrior that the submarine building community would support whatever the Navy and Congress call for. “We’ll support Navy programs,” the source said. The prospect of an acceleration comes as Navy commanders tell Congress they would like to see the fast arrival of more Virginia-Class attack submarines added to the Pacific Fleet. Pacific Commander Harry Harris told Congress that he would like to see more submarines in his area of operations. Virginia-Class attack submarines are necessary for the U.S. to maintain its technological superiority over rivals or potential adversaries such as Chinas, Harris added. With their technological edge and next-generation sonar, the platform can successfully perform crucially important intelligence and surveillance mission in high-risk areas inaccessible to surface ships. For this reason, Virginia-Class attack submarines are considered indispensable to the ongoing Pentagon effort to overcome what’s talked about in terms of Anti-Access/Area-Denial wherein potential adversaries use high-tech weaponry and sensors to prevent U.S. forces from operating in certain strategically vital areas. Virginia-Class subs are fast-attack submarines armed with Tomahawk missiles, torpedoes and other weapons able to perform a range of missions; these include anti-submarine warfare, strike warfare, covert mine warfare, ISR (Intelligence, Surveillance, Reconnaissance), anti-surface/ship warfare and naval special warfare, something described as having the ability to carry and insert Special Operations Forces, Navy program managers have said. “What enables this is the ship control system that we use. You can drive the ship electronically. This allows you the flexibility to be in littorals or periscope depth for extended periods of time and remain undetected,” former Virginia-Class attack submarine program manager Capt. David Goggins said several years ago. The Virginia-Class submarine are engineered with this “Fly-by-Wire” capability which allows the ship to quietly linger in shallow waters without having to surface or have each small move controlled by a human operator, Goggins added. “There’s a person at the helm giving the orders of depth and speed. There’s always a person in the loop. The software is telling the planes and the rudder how to move in order to maintain a course and depth. You still have a person giving the electronic signal,” he said. Also, unlike their predecessor-subs, Virginia-Class subs are engineered with what’s called a “Lock Out Trunk” – a compartment in the sub which allows special operations forces to submerge beneath the water and deploy without requiring the ship to surface, service officials explained. “SEALs and Special Operations Forces have the ability to go into a Lock Out Trunk and flood, equalize and deploy while submerged, undetected. That capability is not on previous submarine classes,” Goggins added. Unlike their “SSBN” Ohio-Class counterparts armed with nuclear weapons, the Virginia-Class “SSN” ships are purely for conventional attack, Navy officials said. Blocks I and II totaling ten ships, have already been delivered. The program has also delivered its first Block III Virginia-Class Submarine, the USS North Dakota. Instead of building what most existing Virginia-Class submarines have – 12 individual 21-inch in diameter vertical launch tubes able to fire Tomahawk missiles – the Block III submarines are being built with two larger 87-inch in diameter tubes able to house six Tomahawk missiles each. “For each one of these tubes you have hydraulics and you have electronics. What we did for Block III is we went to two very large Virginia Payload Tubes – now you have two tubes versus twelve. It is much easier to build these two tubes,” Goggins said. Although the new tubes were conceived and designed as part of what the Navy calls its “Design for Affordability” strategy to lower costs, the move also brings strategic advantages to the platform, service officials say. “In the future, beyond Tomahawk – if you want to put some other weapon in here – you can,” Goggins said. The Block V Virginia Payload Modules, or VPM, will add a new “module” or section of the submarine, increasing its Tomahawk missile firing capability from 12 to 40. The idea is to have additional Tomahawk or other missile capability increased by 2026, when the “SSGN” Ohio-Class Guided Missile Submarines start retiring in larger numbers, he explained. Navy engineers have been working on requirements and early designs for a new, 70-foot module for the Virginia-class submarines engineered to house an additional 28 Tomahawk missiles. The reason for the Virginia Payload Modules is clear; beginning in the 2020s, the Navy will start retiring four large Ohio-class guided-missile submarines able to fire up to 154 Tomahawk missiles each. This will result in the Navy losing a massive amount of undersea fire power capability, Goggins explained. “When the SSGNs retire in the 2020s – if no action is taken the Navy will lose about 60-percent of its undersea strike launchers. When we design and build VPM and start construction in 2019, that 60-percent shortfall will become a 40-percent shortfall in the 2028 timeframe. Over time as you build VPM you will eliminate the loss of firepower. The rationale for accelerating VPM is to potentially mitigate that 40-percent to a lower number,” Goggins explained. Shipbuilders currently working on Block III boats at Newport News Shipyard, Va., say Block V will involve a substantial addition to the subs. “Block V will take another cylindrical section and insert it in the middle of the submarine so it will actually lengthen the submarine a little and provide some additional payload capability,” said Ken Mahler, Vice President of Navy Programs, Huntington Ingalls Industries, said several years ago. The first Block V submarine is slated to begin construction in fiscal year 2019, Navy officials said. Early prototyping work on the Virginia Payload Modules is already underway and several senior Navy leaders, over the years, have indicated a desire to accelerate production and delivery of this technology – which will massively increase fire-power on the submarines. The official baseline for production of Virginia-Class submarines calls for construction of 30 boats, Navy spokeswoman Collen O’Rourke told Scout Warrior. However, over the years, many Navy officials have said this number could very well increase, given the pace of construction called for by the Navy’s official 30-Year Shipbuilding Plan. The submarines are being built under a Dec. 22, 2008, the Navy awarded a contract for eight Virginia Class submarines. The third contract for the Virginia Class, or Block III, covering hulls numbered 784 through 791 – is a $14 billion Multi-Year Procurement, Navy officials said. Multi-year deals are designed to decrease cost and production time by, in part, allowing industry to shore up supplies in advance and stabilize production activities over a number of years. The first several Block IV Virginia-Class submarines are under construction as well – the USS Vermont and the USS Oregon. In April of last year, the Navy awarded General Dynamics' Electric Boat and Huntington Ingalls Industries Newport News Shipbuilding a $17.6 billion deal to build 10 Block IV subs with the final boat procured in 2023. Also, design changes to the ship, including a change in the materials used for the submarines' propulsor, will enable Block IV boats to serve for as long as 96-months between depots visits or scheduled maintenance availabilities, service and industry officials have said. As a result, the operations and maintenance costs of Block IV Virginia-Class submarines will be much lower and the ships will be able to complete an additional deployment throughout their service live. This will bring the number of operational deployments for Virginia-class submarines from 14 up to 15, Navy submarine programmers have explained. Overall, the Virginia-Class Submarine effort has made substantive progress in reducing construction time, lowering costs, and delivering boats ahead of schedule, Goggins said. At least six Virginia Class Submarines have been delivered ahead of schedule, Navy officials said. The program’s current two-boats per year production schedule, for $4 billion dollars, can be traced back to a 2005 challenge issued by then Chief of Naval Operations Adm. Mike Mullen. As mentioned, deliberations are already underway to consider stepping up this production schedule. Mullen challenged the program to reduce production costs by 20-percent, saying that would allow the Navy to build two VCS-per year. This amounted to lowering the per-boat price of the submarines by as much as $400 million dollars each. This was accomplished through a number of efforts, including an effort called “capital” investments wherein the Navy partnered with industry to invest in ship-building methods and technologies aimed at lowering production costs. Other cost-reducing factors were multi-year contract awards, efforts to streamline production and work to reduce operations and sustainment, or O&S costs, Navy officials explained. The U.S. Navy is working to adjust the documentation paperwork regarding the size of its fleet of Virginia Class Submarines, changing the ultimate fleet size from 30 to about 51 ships, service officials have said. Flight of F-22s suffered complete computer failure while crossing the International Dateline, nearly dooming the jets. A new report written by a former Pentagon official who helped establish United States policy on autonomous weapons argues that such weapons could be uncontrollable in real-world environments where they are subject to design failure as well as hacking, spoofing and manipulation by adversaries. In recent years, low-cost sensors and new artificial intelligence technologies have made it increasingly practical to design weapons systems that make killing decisions without human intervention. The specter of so-called killer robots has touched off an international protest movement and a debate within the United Nations about limiting the development and deployment of such systems. The new report was written by Paul Scharre, who directs a program on the future of warfare at the Center for a New American Security, a policy research group in Washington, D.C. From 2008 to 2013, Mr. Scharre worked in the office of the Secretary of Defense, where he helped establish United States policy on unmanned and autonomous weapons. He was one of the authors of a 2012 Defense Department directive that set military policy on the use of such systems. In the report, titled “Autonomous Weapons and Operational Risk,” set to be published on Monday, Mr. Scharre warns about a range of real-world risks associated with weapons systems that are completely autonomous. The report contrasts these completely automated systems, which have the ability to target and kill without human intervention, to weapons that keep humans “in the loop” in the process of selecting and engaging targets. Mr. Scharre, who served as an Army Ranger in Iraq and Afghanistan, focuses on the potential types of failures that might occur in completely automated systems, as opposed to the way such weapons are intended to work. To underscore the military consequences of technological failures, the report enumerates a history of the types of failures that have occurred in military and commercial systems that are highly automated. “Anyone who has ever been frustrated with an automated telephone call support helpline, an alarm clock mistakenly set to ‘p.m.’ instead of ‘a.m.,’ or any of the countless frustrations that come with interacting with computers, has experienced the problem of ‘brittleness’ that plagues automated systems,” Mr. Scharre writes. His underlying point is that autonomous weapons systems will inevitably lack the flexibility that humans have to adapt to novel circumstances and that as a result killing machines will make mistakes that humans would presumably avoid. Completely autonomous weapons are beginning to appear in military arsenals. For example, South Korea has deployed an automated sentry gun along the demilitarized zone with North Korea, and Israel operates a drone aircraft that will attack enemy radar systems when they are detected. The United States military does not have advanced autonomous weapons in its arsenal. However, this year the Defense Department requested almost $1 billion to manufacture Lockheed Martin’s Long Range Anti-Ship Missile, which is described as a “semiautonomous” weapon by the definitions established by the Pentagon’s 2012 memorandum. The missile is controversial because, although a human operator will initially select a target, it is designed to fly for several hundred miles while out of contact with the controller and then automatically identify and attack an enemy ship in an opposing fleet. The Center for a New American Security report focuses on a range of unexpected behavior in highly computerized systems like system failures and bugs, as well as unanticipated interactions with the environment. The lack of transparency in artificial intelligence technologies that are associated with most recent advances in machine vision and speech recognition systems is also cited as a source of potential catastrophic failures. As an alternative to completely autonomous weapons, the report advocates what it describes as “Centaur Warfighting.” The term “centaur” has recently come to describe systems that tightly integrate humans and computers. In chess today, teams that combine human experts with artificial intelligence programs dominate in competitions against teams that use only artificial intelligence. However, in a telephone interview Mr. Scharre acknowledged that simply having a human push the buttons in a weapons system is not enough. CANBERRA – Australia’s government is strengthening its U.S. alliance and plowing ahead with a 10-year, $140 billion military expansion amid rising regional tensions over China’s muscle-flexing on key trade routes in the South China Sea. A defense blueprint released by Australia’s conservative Prime Minister Malcolm Turnbull on Thursday urged Beijing to be more forthcoming about its security intentions in the South China Sea, where China is building artificial islands. While stopping short of directly confronting China over their construction, Canberra warned it would have a “major impact” on the stability of the Pacific and Indian Ocean region over coming decades. The defense paper is Australia’s first since China began building artificial islands on disputed reefs in the South China Sea, upsetting regional neighbors and prompting Washington to challenge Beijing’s claims by mounting freedom of navigation patrols by air and sea. U.S. officials say Beijing is militarizing the region as a way to bolster its maritime claims, while China has defended its work as defensive and legitimate acts. Fresh satellite imagery suggests that China has been building radar facilities on some of the artificial islands, in a move that would improve its military power in the region, a U.S.-based think tank said Tuesday. The report by the Center for Strategic and International Studies on the radar installations in the Spratly Islands came days after U.S. and Taiwanese officials said Beijing had placed surface-to-air missiles on the Paracels chain, north of the Spratlys. Australia faces an awkward diplomatic act in balancing economic ties with China, its biggest trade partner, while trying to forge deeper strategic ties with the U.S. As much as 60% of Australia’s seaborne trade passes through the South China Sea area, much of it bound for China. A 2009 Australian defense blueprint angered Beijing by warning that the pace and scope of China’s military modernization could give its neighbors cause for concern and could lead to potential conflict. “Australia’s security and prosperity is directly tied to the stability of our region and to the maintenance of a stable, rules-based global order,” Mr. Turnbull said Thursday. So far, Australia has been reluctant to follow the U.S. with freedom of navigation patrols, although long-range maritime patrol aircraft have been challenged by China during regular reconnaissance flights through the region. A senior Australian defense official said key allies and regional countries including China had been briefed ahead of the latest paper’s release. “The Chinese won’t be surprised,” the official said. Despite a sharp deterioration in its budget because of tumbling commodity prices and a slowing economy, Australia laid out plans for an ambitious military overhaul including a doubling of its undersea fleet, with 12 new submarines, missile drones, a larger navy and an increase in military numbers. It also called for greater maritime power with ship-destroying missiles and more military exercises with the U.S. Both countries were working to boost rotations of thousands of U.S. Marines, aircraft and warships through Australia, while also working jointly to develop ballistic-missile shield defenses. Canberra pledged to lift military spending to 2% of economic output, or around 58 billion Australian dollars (U.S. $42 billion) a year. Spending this fiscal year is roughly A$32 billion. The rapid rise in Chinese military spending is fueling an arms race in the Asia-Pacific region. A recent report by the Stockholm Institute for Peace Research said Australia was the world’s fifth-largest arms buyer last year. Six of the top 10 global arms importers hailed from the region, including India in the top spot and third-ranked China. Russia has also re-emerged as a potential regional player, building up its submarine forces and recently supplying arms to the tiny Pacific nation of Fiji. “Defense budgets in Asia are increasing in the wake of China’s rise, the spike in its military spending and its apparent attempts to rewrite the rules in the East and South China Seas,” said John Blaxland, a security expert at the Australian National University. Japan’s Defense Minister Gen Nakatani said Wednesday that he has a similar view to U.S. military officials: that China is trying to transform the artificial islands into operational bases. “China’s behavior is trying to change the status quo unilaterally and push it towards that direction further by accumulating actions,” the Japanese defense minister said. Chieko Tsuneoka in Tokyo contributed to this article. America’s Pacific commander offers a military warning. Rarely is a Congressional hearing as clarifying as Tuesday’s appearance of U.S. Pacific Commander Admiral Harry Harris before the Senate Armed Services Committee. Every lawmaker and presidential candidate should study the transcript, but here is a primer. “I believe China seeks hegemony in East Asia. Simple as that,” Admiral Harris told the panel. “China is clearly militarizing the South China Sea” – despite President Xi Jinping’s claims to the contrary – “and you’d have to believe in a flat earth to believe otherwise.” Citing new radar, surface-to-air missiles and runways on disputed islands, some of which were underwater rocks before Chinese dredgers showed up about two years ago, the admiral said Beijing is changing “the operational landscape in the South China Sea.” More than $5 trillion in global trade transits those waters annually. Last March Admiral Harris warned that China is creating a “great wall of sand.” He became Pacific commander in May and began pushing for regular “freedom of navigation” patrols to challenge China’s lawless claims to international waters. The U.S. conducted its first such patrol in October, with a second last month. Senator John McCain used the hearing to suggest that the Navy base a second aircraft carrier in Japan. He also joined fellow Republicans Tom Cotton and Dan Sullivan in noting that the Obama Administration hasn’t clarified if it would defend the Philippines, a treaty ally, if its forces are attacked by China in disputed areas such as Second Thomas Shoal in the Spratlys. China eased some of its pressure on Japan over the Senkaku Islands after the U.S. provided defense assurances to Tokyo in 2014. WASHINGTON – The United States, which is worried by China's military buildup to assert dominance in the South China Sea, will increase freedom-of-navigation operations there, a senior Pentagon official said on Wednesday. "We will be doing them more, and we'll be doing them with greater complexity in the future and ... we'll fly, sail and operate wherever international law allows," Admiral Harry Harris, head of the U.S. Navy's Pacific Command, told a hearing of the House of Representatives Armed Services Committee. "We must continue to operate in the South China Sea to demonstrate that water space and the air above it is international," Harris said. On Tuesday, Harris said in comments coinciding with a visit to Washington by Chinese Foreign Minister Wang Yi that China was "changing the operational landscape" in the South China Sea by deploying missiles and radar as part of an effort to militarily dominate East Asia. China says its military facilities in the South China Sea are "legal and appropriate," and on Tuesday, in an apparent reference to U.S. patrols, Wang said Beijing hoped not to see more close-up reconnaissance, or the dispatch of missile destroyers or strategic bombers. Wang met with U.S. national security adviser Susan Rice on Wednesday and they "candidly discussed" maritime issues, the White House said in a statement. Rice emphasized strong U.S. support for freedom of navigation and urged China to address regional concerns, the statement said. China's official Xinhua news agency said of the meeting that both countries believed all sides should work hard to maintain the peace and stability of the South China Sea. "The South China Sea issue should be resolved via dialogue and peaceful means," Xinhua added. Harris, asked what more could be done to deter militarization, said the United States could deploy more naval assets, although there were significant "fiscal, diplomatic and political hurdles" in the way of stationing a second aircraft carrier group in the region. "We could consider putting another (attack) submarine out there, we could put additional destroyers forward ...there are a lot of things we could do, short of putting a full carrier strike group in the Western Pacific," he said. Harris's comments came a day after he said China had deployed surface-to-air missiles on Woody Island in the South China Sea's Paracel chain and radars on Cuarteron Reef in the Spratly islands further to the south. On Tuesday, his command said China's repeated deployment of advanced fighter aircraft to Woody Island was part of a disturbing trend that was inconsistent with Beijing's commitment to avoid actions that could escalate disputes. Last month, a U.S. Navy destroyer carried out a patrol within 12 nautical miles of Triton Island in the Paracels, a move China called provocative. The United States has also conducted sea and air patrols near artificial islands China has built in the Spratlys, including by two B-52 strategic bombers in November. Lockheed Martin will work to refresh the interfaces of the U.S. Navy’s various submarine warfare subsystems under a $60 million contract awarded in December. The company will update the Submarine Warfare Federated Tactical Systems on multiple submarine classes such as the Virginia-class submarines, Lockheed Martin said Tuesday. Lockheed’s SWFTS systems engineering and integration team will perform work at its Manassas, Virginia-based anti-submarine warfare laboratory. The lab is fully integrated with sonar, tactical control and weapons control and imaging submarine combat systems to facilitate risk mitigation before the submarine is delivered to the Navy, Lockheed noted. Called the Arihant, the 6,000-ton displacement submarine—which draws heavily from Russian technology—carries twelve indigenous K-15 Sagarika missiles with a range of 435 miles. Or, alternatively, it can carry four K-4 nuclear-tipped ballistic missiles — each with a range of 2,200 miles. However, unlike U.S. ballistic missile submarines, the Indian vessel also has a hunter-killer role and will be armed with a host of torpedoes and anti-ship missiles. It is powered by an 80 megawatt pressurized water reactor and can reach a submerged speed of twenty-four knots. Though Indian crews trained on a Russian Akula-class (Project 971 Shchuka-B) in preparation to man Arihant and the submarine draws on Russian technology, the boat is half the size of Akula. Further, the Arihant design does not seem to bear much physical resemblance to its Russian forebearer—at least externally. Two more Arihant-class submarines are currently under construction at the shipyards in Visakhapatnam. The follow-on vessels will be larger and incorporate improvements over the lead boat. Arihant is the first of five nuclear–powered ballistic missile submarines that India is planning to build. The first-in-class boat reportedly cost $2.9 billion to complete. Meanwhile, India is proceeding with the design work on a new class of nuclear-powered attack submarines. Six indigenous nuclear-powered attack boats are currently planned, but there are very few details available about those designs. Presumably, like the Arihant, the new attack submarines will be based on technology gleaned from the Russian Akula-class (Project 971 Shchuka-B). India has leased one such boat, which is called INS Chakra and may lease another Akula in the near future. Petty Officer Second Class Sara Brookshier received a warm welcome and homecoming from the veterans at Harold Kinne Post #3296 last Monday evening, Feb. 15. If the name is familiar, but you're having difficulties placing her, she is the daughter of Boyd and Millie Brookshier of Orofino, and her photo can be seen Monday through Friday on the refrigerator of the Dog House on Main St.
example of honor, courage, and commitment, long before she realized that they were the Navy's core values. Sara joined the Navy League Cadet program in Tri-Cities, WA, at the tender young age of 11. The U.S. Naval Sea Cadet Corps, or USNSCC, is comprised of two programs. The Naval Sea Cadet Corps (NSCC) program is for youth ages 13 through 17. The junior program - the Navy League Cadet Corps (NLCC) - is for those between the ages of 11 through 13. The program offered a simplified version of basic training to include the proper attention to military uniform, marching, facing movements and history. Advancing to the Sea Cadets at 13, Sara attended "boot camp" at Fort Lewis, WA. All through high school, she rose through the ranks as leading Petty Officer in her group as she graduated from high school. After looking at all of the branches of military service Sara joined the Navy. She entered as an E-3 vs. an E-1, for her experience and received a substantial raise in pay when compared to those who were just beginning their service in the Navy. Sara still attended the Navy's basic training camp, but said it was really pretty simple and much less stressful for her due to her experience as a cadet. "The Navy was the best fit for me," she explained, for the job training and the opportunities they offered. "When I graduated from high school, I didn't know what I wanted to do. I knew I didn't want to be stuck in a college classroom, so I figured I'd serve for four years giving myself time to figure out what I wanted to do when I grew up. I wanted to see the world and travel. I'd get my G.I. Bill to go to college, get out and go." "My first assignment was at the Naval Air Station in Fallon, Nevada, which is typically not the location one may envision with the Navy," Sara laughs. "I worked as an aircraft mechanic and was with a command which served as support for TOPGUN, though not quite as dramatic as the movie," she assures me. While there, Sara was sent on two week detachments to Key West, FL, Beaufort, SC, and to both Lemoore and China Lake, in CA. Following her assignment in Nevada, Sara received three months of training in Camp Shelby, MS, after volunteering to serve in Afghanistan in 2009. Afghanistan was certainly an experience to remember. As a guard for the prison, she certainly faced the most challenging moments of her career, both physically and mentally. "Sleeping in a war zone and working in a prison can be extremely stressful. We were trained for a little bit of everything," she remembers. "We learned about body armor and traveling in a convoy." As a female, Sara managed to utilize her expertise in driving a manual transmission, and being able to back up using only the mirrors. "It saved me from having to fly, which I didn't care for," she admits, "especially the combat landings, so I drove a lot. We were even OC (Oleoresin Capsicum, or more commonly known as pepper) sprayed, which was definitely one of the worst experiences I've ever had." Being sprayed is a type of prerequisite to being adequately certified to use the spray as a measure of non-lethal force. Though many people react differently to the spray, it is quite debilitative and demands a certain level of respect. Experiencing the spray first hand helps those who have it to know when to use it appropriately. "One of the best experiences there, was shooting a .50 caliber," she grins. "It's a big gun for a small person." "We were a very close-knit unit there," said Sara. "When we got off work, we went to the gym or on Thursdays, gathered to watch the new movie we received and on Fridays, to what we called a family dinner." Sara's parents remember the difficult days and months of waiting for her return or even to call home. "It seemed like everything was classified," said Millie. "What do you talk about?" Fortunately, Sara was pulled from her assignment in Afghanistan early and everyone's prayers were answered when she arrived home safely. Another assignment and "vertical replenishment"
Her four years were almost up, and then there were indications that orders for Guam rested on the horizon. So Sara re-enlisted, and spent the next three years at a Navy helicopter squadron on Anderson Air Force Base in Guam. Sara deployed on a supply ship responding to carrier groups requesting supplies, "anything from ice cream to fuel," she shares. Then the ship would meet them for what was formally known as "vertical replenishment." While on that deployment Sara was able to visit several locations in Japan and Australia. She had served between six and seven years when she was a little "burned out" with her job. Her Chief suggested she try something new. "Try recruiting," he suggested, and so she re-enlisted a third time to become a recruiter. After receiving more training in Florida, she wastransferred to Morgantown, West Virginia, where she currently resides. At the beginning of 2015, Sara learned that the submarine force, which had only previously been opened to female officers as of 2011, were now being extended to enlisted women as well, and she applied. The women were chosen based on their performance in their current rating, their desired submarine rating assignment, and the overall needs of the Navy for rating community health, according to the statement, along with performance evaluations, warfare qualifications, commanding officer endorsements, sea service time, physical readiness testing, and similarity of current rating to desired submarine rating. In June of 2015 Sara Brookshier was named one of the first 30 female sailors of the highest caliber to be selected. These young women have earned the opportunity to make history and be among the first to join the Submarine Service. The women who pass their medical screening will be sent to a tailored training pipeline, to include Basic Enlisted Submarine School in Groton, CT, and technical training at "A" schools and "C" schools before reporting to Bangor, WA. The Navy received an overwhelming response from women currently serving across the fleet in a variety of concentration areas, from the surface fleet, to our aviation community, to Seabees, to Sailors in the Fleet Reserve. "It wasn't easy to select from the large number of highly skilled and talented women who applied to fill a fixed number of billets, as every single one of the Sailors who applied were the best of the best at what they have done during their naval careers," stated Rear Admiral Chas Richard, Commander of the Submarine Group Ten and the Enlisted Women in Submarines Task Force. "We couldn't be more pleased with the amount of interest shown by enlisted women in wanting the opportunity to serve in the undersea warfare domain," claimed Rear Adm. Richard. "It's an exciting time in the submarine force, as we continue to move forward in shaping the future of our force, drawing from the best pool of talent possible." When asked about the gender issues of serving in the military, particularly in non-traditional occupations, and most certainly to be addressed in her new endeavor to begin this summer on a submarine, she tells me, "There have been other females who have broken those barriers before me. Everybody brings with them something different. "If you are female and you come in to work, there are no issues. As an aircraft mechanic, I may not be able to lift down a 200 pound component, but my tiny little arm fits into holes to reach screws others can't. I tell my new girls, 'I don't care that you're a girl; you may not be able to lift that toolbox, but there's the dolly over there, make it work.'" "I'm sure there will be a few small kinks to work out on the sub," admits Sara. "It's something new and they're not used to females being in their domain, but once we get there and get the kinks worked out, I suspect it will all work out just fine." Similar to women serving in combat, enlisted women serving on a submarine cuts through one of the military's few remaining gender barriers. Female officers have been on submarines now for several years, but always have had their own quarters. And here is where it becomes a real issue. Submarines are extremely limited in the amount of space available, and to have enlisted women on board requires making space for sleeping and bathing facilities. But it can be done. "They're retrofitting quarters for us," Sara says proudly. "There will still be issues, there always been issues in all occupations, but if one works hard and pulls their own weight, it's all that matters," reasons Sara. As a recruiter Sara gets to see the front of it. Navy SEAL and SWCC (Special Warfare Combatant Crew) has recently been opened to females. "As a recruiter," she says, "I get to hear about the new challenge of finding females who want to step into these communities. They're still working out the finer details. Honestly, if there's a girl who can make it in the SEALs I say good on you, do it, go with them." It will be quite interesting to see the only three jobs that were closed to women be challenged; submarines, SEALs, and SWCC. Sara knows firsthand that women are advancing. "We've busted down the door for subs, and we will now have females in combat, it's just about working out the kinks." "My parents have raised me to work hard. Spending time at the rodeo grounds in Pendleton, it was all guys. I was hired on to help Dad my final summer before basic," she adds, "I didn't play the good old boys club, and it definitely helped me coming into the Navy. I wasn't scared. I have work to do. Teach me, let's get this done and let's go home." BANGOR – Who's flying drones over the Bangor submarine base? The Navy wants to know. On Feb. 8, a drone was seen flying above Naval Base Kitsap-Bangor and reported by a civilian employee, spokeswoman Silvia Klatman said. The airspace above the base is designated as "prohibited." It's illegal and hazardous to operate there without permission and coordination of authorities, according to the Navy, which is investigating. "It's our intent to support the investigation and prosecution of this reported act, and any others that may occur, in coordination with civilian law enforcement," Klatman said. She wouldn't provide more information while the investigation is ongoing except to say the Navy is committed to the security of its infrastructure, people and neighbors. Agents interviewed neighbors outside the fence last week, said Al Starcevich, whose family's 110-year-old homestead on Olympic View Road is pinched between the base and Hood Canal. He told a couple of men in suits that he hadn't seen anything unusual. The drones were reported at night. "It could be a hoax, but worst-case scenario, it could be clandestine, a foreign government, a cell," Starcevich said. "The creepy thing is they're only doing it at night. What are you going to see at night unless you have an infrared camera?" Kitsap Drones owner Joe Sullivan hasn't heard from the Navy or about drones over bases. "I keep up on all the drone news," he said. "Every drone pilot I know knows that all of Bangor is a no-fly zone." On Friday it became much easier to track down drone owners, he said. A regulation kicked in requiring all drones of more than 0.55 pounds be registered with the FAA. Drones can fly at night, at least for now. In fact, they can go farther in the dark because it's easier to see their green and red flashing lights, Sullivan said. They must always remain within the pilot's sight. The FAA designated the airspace above Bangor as "prohibited" in May 2005 at the Navy's request. No aircraft, including drones, can fly from the surface up to 2,500 feet. Besides the base itself, the area extends to the water across Hood Canal and the Navy-owned portion of the Toandos Peninsula. Security forces are supposed to shoot down violators but have yet to do so, said Doug O'Donnell, chief pilot at Avian Flight Center at Bremerton National Airport. NCIS agents have shown up at the airport, looking for planes they claim were too low. O'Donnell said he recommends that pilots keep a comfortable distance above 2,500 feet to prevent confusion from trackers on the ground. Bangor is home to eight of the Navy's 14 ballistic-missile submarines. Each can carry up to 24 missiles with multiple nuclear warheads. The commander of American forces in the Pacific is worried that the United States doesn’t have enough submarines to meet the rapidly modernizing fleets being put to sea by China and Russia – and that things will only get worse before they get better. The U.S. Pacific Command “suffers shortage of submarines today, my requirements are not being met,” Adm. Harry Harris told the House Armed Services Committee Wednesday. Harris said he’s most concerned that the Pentagon’s plan to modernize its own fleet may not move fast enough to keep pace with its Pacific rivals. Most worrisome is the building spree that Russia and China are conducting to bolster their submarine assets in the Pacific. Late last year, Russia completed improvements to its naval base on the Kamchatka peninsula in the northern Pacific in part to accommodate new nuclear-powered Borei-class ballistic missile submarines. The boats are designed to carry 16 Bulava ballistic missiles each. A total of eight of the vessels are planned by 2020. China has already built four nuclear-powered ballistic missile JIN-class submarines, with an unknown number still being built. But under the terms of the U.S. Navy’s own long-range shipbuilding plan, that will become increasingly difficult. The plan calls for the number of attack submarines to fall from 52 today to 41 in 2028 before gradually clawing back to 50 by 2044. Harris also repeated his plan to carry out more so-called “freedom of navigation” operations in the South China Sea, where China has engaged in a land grab in recent years and built islands in order to push its territorial claims further out to sea. China has grown increasingly assertive in its claims to territory in the South China Sea, embarking on an ambitious – and controversial – island-building project in the critical waterway. On Tuesday, as Chinese Foreign Minister Wang Yi met with Secretary of State John Kerry at the State Department, reports emerged that Beijing had sent fighter planes to Woody Island in the South China Sea, the same island that Beijing recently deployed HQ-9 surface-to-air missile batteries. The deployment of the J-11s Flanker and JH-7s Flounder aircraft raised tensions even further between China and its neighbors Taiwan and Vietnam, who also claim rights to the island. Last month, a U.S. Navy destroyer sailed within 12 nautical miles of Triton Island in the Paracel chain in a show of force that Beijing said only increased tensions in the region. The U.S. also flew two B-52 bombers near artificial islands that China has built in the Spratly Island chain in the South China Sea in November. ARLINGTON, Va. – The Navy admiral in command of U.S. strategic deterrence forces said the 2017 defense budget proposal will meet his requirements but leave no margin for new risk. “The president’s budget for [fiscal] ’17 strikes a responsible balance between national priorities, fiscal realities and begins to reduce some of the risk we have accumulated because of deferred maintenance and sustainment,” said Adm. Cecil Haney, commander, U.S. Strategic Command (USSTRATCOM), testifying Feb. 24 before the House Armed Services strategic forces subcommittee. “This budget supports my mission requirements but there is no margin to absorb new risk. Any cuts to that budget will hamper to sustain and modernize our military forces. Haney expressed his support for the Air Force’s Long-Range Strategic Bomber to replace the B-52 – along with the new bomber’s Long-Range Standoff cruise missile – and the Ground-Based Strategic Deterrent to replace the Minuteman III intercontinental ballistic missile, in addition to the Navy’s Ohio Replacement ballistic-missile submarine (SSBN), the latter being his top modernization priority. “Recapitalizing our sea-based strategic deterrent force remains my top modernization priority,” Haney said in his written statement submitted to the subcommittee. “The Navy’s SSBNs and Trident II D5 ballistic missiles constitute the Triad’s most survivable leg. The Ohio-class SSBN fleet is undergoing significant sustainment efforts to maintain our nation’s required high operational availability and extend the life of the D5 ballistic missile. USSTRATCOM continues to strongly support and work with the Navy as it modernizes the SSBN fleet. The Ohio Replacement SSBN, currently in development and expected to be fielded in 2031, will continue to serve as the Nation’s survivable strategic deterrent into the 2080s. According to a report in Economic Times, the indigenously-built boat is now fully-operational and over the past few months, several weapon tests have taken place in secrecy that have proven the capabilities of the vessel. INS Arihant is first of the five in the class of submarines designed and constructed as a part of Indian Navy’s Advanced Technology Vessel (ATV) project. The 6,000-ton vessel was built at the Ship Building Centre in the port city of Visakhapatnam and it was revealed for the first time in 2009. The Arihant, which is the first of five nuclear missile submarines or SSBNs planned for induction, has also undergone deep sea dives off Vishakhapatnam where it was built. A Russian diving support ship —the RFS Epron that arrived on October 1 — has been accompanying the Arihant on its deep sea dives and launch tests. The Epron — a Prut class submarine rescue vessel — was also the Russian representation for the recently concluded International Fleet Review (IFR) in Vishakhapatnam. India does not currently possess a submarine rescue vessel of this class, a vital requirement during weapon firing tests where all possibilities need to be catered for. ARLINGTON, Va. — The commander of U.S. forces in the Pacific and Indian Oceans praised the Navy’s Virginia-class attack submarines (SSNs) and stressed the value of them in surveillance and in countering Chinese and Russian naval forces. The Virginia-class SSN, built by General Dynamics Electric Boat and Huntington Ingalls Newport News Shipbuilding, is the Navy’s newest attack submarine, of which 12 are in commission, four of them stationed in the Pacific. Ayotte said Navy officials told her that only 62 percent of requests from combatant commanders for attack submarine missions were being met. Harris responded that the gap is “about 62 percent” but that the exact numbers were classified. Addressing the build-up of modern submarine forces in the region, Harris said that he was concerned about the Russian and Chinese submarines as they increase in their capability. “The Russian submarine force, in my opinion, did not take a hiatus when the Cold War ended,” he said. “So now we have the Dolgorukiy-class SSBN, now in their Far Eastern fleet. The Chinese are building the Jin-class SSBN, which has the capability — if mated with the right missile — to threaten the entire United States. The UK Royal Navy's third Astute-class attack submarine Artful is undergoing final contractor sea trials ahead of its maiden deployment. The submarine sailed from Barrow-in-Furness to HM Naval Base Clyde in August last year, and was officially handed over to the Royal Navy in December. Artful is being tested for its performance and seaworthiness before it is commissioned in mid-March this year. The trials included the firing of six training variants of the Royal Navy's heavyweight Spearfish torpedo on the British Underwater Testing and Evaluation Centre near the Isle of Skye. These firings were the most complex of the trials conducted to date, as they required a large number of interconnected systems to function together, which ranged from loading the torpedoes into their tubes, through to the sonar detecting the target and the command system preparing a firing solution. Artful commanding officer Stuart Armstrong said: "These trials are hugely important as they prove the submarine's primary capability as a weapon system and it gives us the confidence that should we need to fire in anger everything has been tried and tested." Artful is a nuclear-powered submarine, whose nuclear reactor will not need to be refuelled during its 25-year service life. It can accommodate up to 38 weapons in six 21in torpedo tubes. BAE Systems Marine Services (BAES (MS)) was contracted to build seven Astute-class submarines for the Royal Navy, which will progressively replace the Trafalgar-class submarines. HMS Astute and HMS Ambush have already been accepted by Navy Command, while the next two submarines, Audacious and Anson, are currently being built in Barrow, with Agamemnon and an unnamed vessel to follow. NEW DELHI – India's first nuclear armed submarine is now ready for full fledged operations, having passed several deep sea diving drills as well as weapons launch tests over the past five months and a formal induction into the naval fleet is only a political call away. 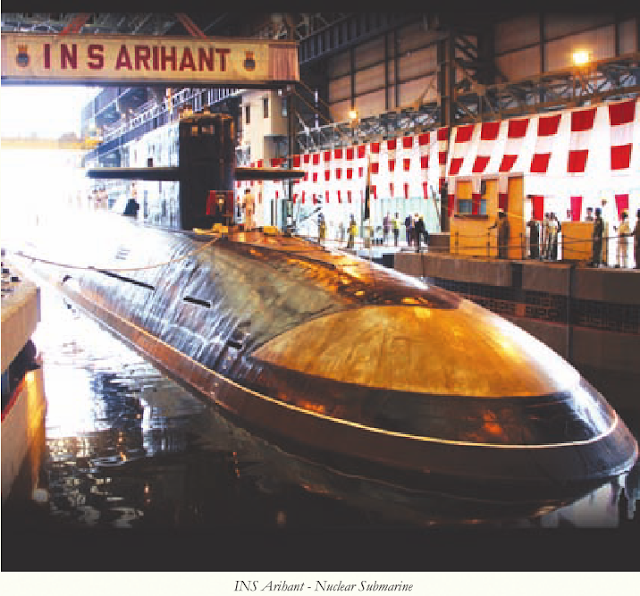 The Arihant, which is the first of five nuclear missile submarines or SSBNs planned for induction, has also undergone deep sea dives off Vishakhapatnam where it was build. A Russian diving support ship – the RFS Epron that arrived on October 1 – has been accompanying the Arihant on its deep sea dives and launch tests, officials told ET. The Epron – a Prut class submarine rescue vessel – was also the Russian representation for the recently concluded International Fleet Review (IFR) in Vishakhapatnam. India does not currently possess a submarine rescue vessel of this class – a vital requirement during weapon firing tests where all possibilities need to be catered for. The Arihant incidentally did nottake part in the IFR even though it was ready due to security concerns. The presence of 24 foreign warships, equipped with sensors and equipment that could pick up vital electronic intelligence being the main deterrent. interact with the submarine has already been commissioned into the Navy. At present, work is already in progress on two more Arihant class submarines at the Ship Building Center (SBC) in Vishakhapatnam which will be larger and more advanced than the first boat. The navy is also accelerating work on INS Varsha – a new strategic naval base with underground pens on the Eastern Coast near Kakinada – where the nuclear assets would be based. With a total of 48 submarines on order in export deals by the end of 2015 and other orders that include Australian, Indonesian and Indian submarine contracts coming up this year, submarine sales are expect to grow significantly. The advent of submarine technology now offers underwater endurance lasting several weeks and is equipped with ling-range anti-ship missiles and torpedoes and land-attack missiles. These capabilities increase their effectiveness as area-denial weapons and allow for stealth attacks on land targets. Between 2006 and 2015 the growing and highly competitive export market for submarines was completely dominated by China, France, Germany, Russia, South Korea and Sweden. However, they were joined by Japan in 2015 when it submitted a bid to an Australian tender for 12 submarines. The United States and the United Kingdom currently produce only nuclear-propelled submarines, which they do not offer for export. In 2011–15, 16 submarines were exported. Germany supplied 3 submarines to Greece, 2 each to Colombia and Israel, and 1 each to Italy and South Korea. Russia supplied 4 submarines to Viet Nam and 1 to India, while Sweden supplied 2 to Singapore, Stockholm International Peace Research Institute (SIPRI) said in a report Monday. Germany is to deliver 6 to Turkey, 5 to South Korea, 4 to Egypt, 2 to Singapore and 1 each to Greece, Israel and Italy. Russia is scheduled to transfer 2 each to Algeria and Viet Nam, the report stated. France is to deliver 6 to India and 5 to Brazil. China is scheduled to transfer 8 to Pakistan and 2 to Bangladesh, while South Korea is to deliver 3 to Indonesia. India’s INS Arihant, the first of five nuclear missile submarines or SSBNs planned for induction, has undergone deep sea dives off Vishakhapatnam and is ready for commissioning. Delivery of the Navy's multibillion-dollar Ford-class aircraft carrier lead ship may be delayed by up to three months, according to the shipbuilder and fiscal year 2017 budget justification documents. Huntington Ingalls Industries Chief Executive Officer Mike Petters said Feb. 18 during a quarterly earnings call that his company is doing everything it can to deliver the Gerald R. Ford (CVN-78). "We expect that to happen in the middle of the year," he added. "There is a sequence from builders' trials to delivery that we go through, and so the team down there is committed to getting it done as quickly as possible." The Navy's FY-17 budget request reveals CVN-78 delivery is delayed by one quarter -- from the second quarter to the third quarter of FY-16 -- compared to the previous year's budget documents. The service set aside $70 million in FY-17 and $318 million over the future years defense plan for preparatory work for the carrier's delivery. "As I said earlier, the ship is complete," Petters said. "We're testing systems now that have been installed, and not only are we testing the systems themselves, kind of, is the system working the way that it was designed to work, we're also testing does it work with the other systems the way its supposed to work too." Petters said integration for a lead ship is a "big challenge," and he does not "want to commit to any specific date on the schedule, what I'm going to tell you is it's going to go as quick as we can get it out." Further, Petters said the service's FY-17 budget request is a "great indication" the Ohio-class replacement ballistic missile submarine program is on track and discussion will continue this year on how to fund the program. "On the Ohio Replacement Program, I've been pretty vocal about, we've got to find a separate source of money, we got to find more money for the shipbuilding budget to handle the Ohio Replacement Program, because it could and it's big enough, so that it would crowd out other shipbuilding," he said. "I think this is going to be a discussion that we're going to have for the next five to 10 years, really is how we're going to pay for the program and how comfortable can we do it inside the Navy's budget." Petters said there is a lot of discussion about various funding mechanisms to pay for the next-generation ballistic missile sub but from his standpoint the company is agnostic on which option is most suitable. "What we really need to see is that the funding is there without affecting other programs, and that's what happens in this budget and that's what looks like is happening in the Navy's plan by and large," he added. In the years the Navy builds the Ohio-class replacement sub the service will also build one Virginia-class attack submarine per year. Petters said it is more of a "complex challenge" for the industrial base to build one Ohio-class replacement sub and one Virginia-class sub than building two Virginia-class subs per year. HMCS Windsor affected by battery cell malfunction. 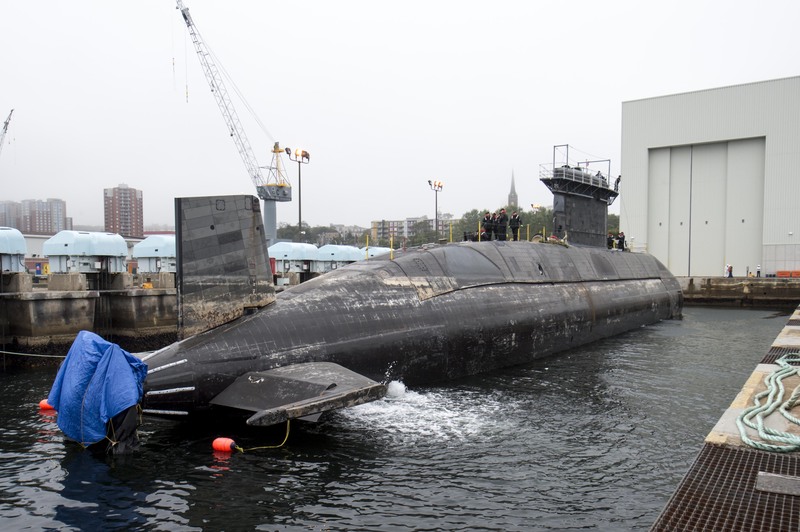 NORFOLK, Va. — The commander of Canadian Fleet Atlantic says HMCS Windsor has been forced to dock in the United States after the submarine had mechanical problems at sea. Commodore Craig Baines says the sub was headed back to port in Halifax on Monday when there was a minor issue in its battery cells, which help propel the vessel. Baines says HMCS Windsor was sent to the Norfolk naval base in Virginia so that the problem could be investigated, and it arrived on Thursday. He says once the investigation is complete, the submarine will resume its journey home to Halifax, but he couldn't say when that would be. Baines says HMCS Windsor and her 60-member crew had been conducting exercises at sea with the United States navy for roughly four to five weeks. HONG KONG/BEIJING – From listening posts to jet fighter deployments and now surface-to-air missiles, China's expanding facilities in the Paracel Islands are a signal of long-term plans to strengthen its military reach across the disputed South China Sea. Eventually, both disputed island groups are expected be used for jet fighter operations and constant surveillance, including anti-submarine patrols, while also housing significant civilian populations in a bid to buttress China's sovereign claims. Crucially, that would give Beijing the reach to try to enforce any effective air defense zone in the South China Sea, similar to the zone it created over the East China Sea in late 2013. U.S. officials confirmed on Thursday the "very recent" placement of surface-to-air missiles on Woody Island, the site of the largest Chinese presence on the Paracels, criticizing the move as contrary to China's commitments not to militarize its claims in the South China Sea. Ian Storey, a South China Sea expert at Singapore's ISEAS Yusof Ishak Institute, said he believed similar weapons could be deployed to China's holdings in the Spratlys within a year or two. "This would enable China to back up its warnings with real capabilities," he said. While Chinese officials might use on-going U.S. operations in the South China Sea as justification, "there is a plan that has been in place for quite some time,” Glaser said. The HQ-9 missile batteries, guided by radar tracking systems, have a range of 200 km (125 miles) and are the most significant defensive weapon China has yet placed on the Paracels, regional military attaches say. The move could complicate surveillance patrols carried out routinely by U.S. and Japanese aircraft as well as flights by U.S. B-52 long-range bombers, operations China objected to last November. It could also challenge operations by Vietnam's expanding fleet of Russian-built SU-30 jet fighters. It landed fully-armed jet fighters on an expanded airstrip on Woody Island in November, and reinforced hangars have been completed, regional diplomats said. Coast guard and fishing facilities have also been expanded, along with fuel storage tanks and housing for more than 1,000 civilians in what was declared "Sansha City" in 2012, Chinese analysts say. A similar build-up in the Spratlys would give China its first permanent military presence deep in the maritime heart of Southeast Asia, military attaches say. China claims most of the South China Sea and while Vietnam and Taiwan also claim both archipelagoes in their entirety, the Philippines, Malaysia and Brunei also claim part of the Spratlys. The waterway carries some $5 trillion in seaborne trade each year. Chinese officials have repeatedly stressed the civilian nature of the Spratlys expansion, including lighthouses, search and rescue bases and environment research stations. Three runways have recently been completed and China last month announced the first successful test landings of civilian airliners on the new 3,000-metre airstrip at Fiery Cross reef. Chinese analysts say the first military flights from the Spratlys could start within months.Spratlys could start within months. Wu Shicun, the head of China's National Institute for South China Sea Studies, said lessons learnt from the Paracels expansion could be transferred to the Spratlys, particularly to manage water supplies and waste. "There is no real dispute in the Paracels ... so the development on the Paracels has been much faster and governance has also been more complete," he said. Yanmei Xie, a Beijing-based security analyst with the International Crisis Group think-tank, said China would seek to exploit dual-use facilities, such as radars and runways, on the Spratlys but would be cautious about openly deploying military assets. "The Spratly Islands are more complicated because they involve every claimant," she said. "It can be more costly to China diplomatically and geopolitically." SAN DIEGO – For the Navy, the best defense against a high-tech enemy may be a low-tech strategy. After decades of building equipment, aircraft and ships designed to communicate with each other and back to shore, the Navy is now looking to "selectively disconnect" its systems to minimize vulnerability to cyberattacks, said Rear Adm. Lorin Selby, commander of the Naval Surface Warfare Center. "We're going back now and trying to selectively disconnect things and slow down some of these connections and only do it where we think it makes sense, where it's safe to do it," Selby told an audience at the AFCEA West conference in San Diego. "We've got to be more judicious with the things we connect to the internet or to shore, those kinds of vulnerabilities." Speaking to Military.com following his briefing, Selby acknowledged that reaching this network-optional goal was a multi-step endeavor and could take a long time. "[Naval Sea Systems Command] is in the process of finding out which systems should be disconnected and which systems should be hooked up, so that's kind of an ongoing process," he said. This initiative, he said, was connected with CYBERSAFE, a new strategy introduced by the Navy last year to promote better cyber hygiene and minimize system vulnerabilities. The program is modeled after SUBSAFE, which was introduced after the sinking of the nuclear-powered attack submarine USS Thresher in 1963 to ensure subs had the best possible chance of resurfacing safely. Selby referred to comments by Vice Adm. Ted "Twig" Branch, the Navy's head of information warfare, who noted that it took 20 years to implement SUBSAFE successfully after the program was first launched. In the end, Selby envisions a system that will be able to disconnect and reconnect at a commander's discretion without affecting normal military duties. "Whether it's ships, submarines, aircraft, whatever it is – there's a point where you say, you know what, I think I'm going into an unsafe environment, I'm going to disconnect. I want to be able to operate off the network for a while, do my job, whatever my job is, and then when I want to, when it's safer, I want to plug back in," Selby said. "So it's network optional warfare. Networked or not. And when I'm not, I've got enough organic systems on my ship or submarine that I can still fight the battle and do what I need to do." PEARL HARBOR, HAWAII -- Recently, 30 Japanese officers and sailors from the Japanese submarine Kuroshio visited the USS Greeneville in Pearl Harbor, Hawaii. For over an hour the officers and crew of both submarines met and learned from each other in what was dubbed a highly successful event, according to a recent news release. "During the visit, Greeneville's crew showcased their tremendous warfighting capabilities and dedication to mission readiness," the release says. This meeting marks the first time the Japanese have visited USS Greeneville in recent history, solidifying the relationship between the U.S. and Japanese navies, the release says. Overall, the event was very well received by both the Kuroshio and the Greeneville crews, it adds. It is made even more significant due to the Greeneville's history. Nine boys and men died when the submarine surfaced beneath a Japanese fishing vessel, the Ehime Maru, on Feb. 9, 2001, off Oahu. CDR Gabe Anseeuw, the Greeneville's commanding officer, was also invited shortly after the tour to a "Sayonara" party, marking the departure of the Kuroshio from Hawaiian waters. "I was extremely happy to have this opportunity to meet with the officers and crew of the Kuroshio," CDR Anseeuw said. "The crew's pride in the ship was clearly evident and helped to solidify relations. The visit was extremely positive. "I was humbled by the extreme friendship and generosity displayed by our Japanese friends at the Sayonara party, partaking in the evening's ceremonial customs and traditions," he added. Australia’s impending decision to choose a new submarine involves grand strategy that could lock Australia into a strategic posture for the next thirty years or more. Australia’s future submarine programme is the largest and most complex defence procurement in the nation’s history. The decision as to which submarine to choose has become one of grand strategy with far-reaching economic, political, and strategic consequences. While technical issues to establish the “best” submarine remain important, strategic, political and economic factors are also key determinants of the decision. It could have significant impact on Australia’s regional relations and the ability of Australia to act independently within the region. The three contenders in the current evaluation process are: France’s state-controlled naval contractor DCNS offering a conventional-powered version of the nuclear-powered Barracuda-class submarine; ThyssenKrupp Marine Systems (TKMS) of Germany with a Type 216 Class submarine, an up-sized version of the popular Type 214 submarine; and the Government of Japan with a proposal based on the existing Soryu class. None of these options are ideal for Australia’s requirements. The Australian Government has frequently used A$50 billion as the projected cost of the future submarine project, but this includes sustainment cost through the 30-year life of the fleet. These usually equate to about two-thirds of the cost of construction. Recent reports suggest that competition among the bidders has led to the acquisition cost being at least $5 billion less than expected. The winning bidder should be announced by mid-2016. The contest between Japan, Germany and France has becoming increasingly bitter with sniping between the rivals. Canberra is under huge lobbying pressure from the parties concerned. Japan has been accused of putting out false media reports that the Germans had been ruled out due to concerns about their ability to build larger submarines. These reports were subsequently denied by the Australian Government and the Australian representatives of TKMS. The Japanese Ambassador to Australia recently entered the argument by publicly claiming that the technical risks of the European options were higher than those of the Japanese one. The Japanese claim it is difficult to convert a nuclear submarine to conventional power as the French are planning to do, or double the size of a smaller submarine as the Germans are proposing. On the other hand, the Europeans are quick to point out that the Japanese have no experience in building submarines overseas in conjunction with foreign builders. An Australian government could not afford to choose any proposal that did not offer significant economic benefits for Australia. Each bidder has been asked to provide three estimates: one for construction overseas, one for partial assembly in Australia, and one for full build in an Australian shipyard. After some hesitancy by the Japanese interests, all three bidders now say they will undertake most construction work in Australia. So far the European firms have been more successful than the Japanese in promoting the economic benefits of their proposals. However, Japan has boosted its credibility in this regard through negotiations with the British companies, Babcock and BAE Systems, which are well established in Australia. Babcock does maintenance work on Australia’s Collins-class submarines, including torpedo tubes and other parts of the weapons system, while BAE Systems, which builds the UK’s nuclear submarines, employs 4,500 people in Australia, including on current naval shipbuilding projects. Political factors are central to the submarine decision – both domestically and internationally. Domestically, the decision is the subject of much political interest due to the perceived economic and employment benefits of the project, particularly for South Australia, the state most likely to build the submarines. The South Australian economy is stagnating and support for the coalition government in Canberra has dropped with several coalition members of Parliament under threat of losing their seats. Internationally, selection of the Japanese option would not be well received in China. It would be seen in Beijing as Australian participation in the US-Japan effort to contain China. There is no doubting China’s importance to Australia. China is by far Australia’s biggest trading partner accounting for about 26 per cent of total foreign trade in 2014-5 as compared with Japan’s 12 per cent. Australia’s trade with China has also continued to grow strongly over recent years while trade with Japan has stagnated with relatively little growth. Grand strategy really comes into play with the strategic implications of the submarine decision. Effectively the decision is a choice between Australia locking itself into an alliance with Japan for the next four decades, or having some strategic independence within the region. International submarine experts point out that a country operating a small fleet of submarines (twelve boats or less) becomes locked into technical and logistic support from the country of origin of the submarines. A decision in favour of Japan would also be a solid affirmation of defence cooperation between Australia, Japan and the US. This cooperation is actively promoted by both Tokyo and Washington as part of balancing a rising China. The US is also a powerful player in the decision because the American systems preferred for the new submarines may be releasable to Japan but may not be available with the European options. European builders build for the global submarine market and the Americans could assess that selection of a European option could involve unacceptable risk of leakage of highly classified data. This could ultimately prove the deciding factor. Although the European options would provide longer-term strategic flexibility, it seems likely that the final decision will go the way of the Japanese. This will mean Australia’s submarines, as the most powerful component of its naval forces, will be difficult to sustain if Australia is not acting in concert with Japan. It is a matter of grand strategy to determine whether that is acceptable. *Sam Bateman is an adviser to the Maritime Security Programme at the S. Rajaratnam School of International Studies (RSIS), Nanyang Technological University, Singapore. He is a former Australian naval commodore who has worked in force development areas of the Department of Defence in Canberra. GROTON — An art teacher wanted to create a “sub trail” as part of the celebration of the 100th anniversary of the arrival of the first submarine to the U.S. Naval Submarine Base, and her idea has taken hold. Teacher Joy Supples’ plan was to have local artists create a “fleet” of submarine sculptures, similar to the “Whale Tail” art project in New London a few years ago. About a dozen sponsors have come forward so far, pledging to pay for 13 of 20 planned submarine sculptures that would be unveiled at the Groton Fourth of July parade. The 5-foot-by-4-foot fiberglass sculptures, which have been ordered, would be decorated by local artists and ultimately displayed at sponsor locations across southeastern Connecticut. A sub trail computer application would guide visitors to each sculpture and offer information about the sub, sponsor and artist. Supples, a teacher at Ella T. Grasso Southeastern Technical High School, said she saw an opportunity to galvanize the community and celebrate the sub base’s history through art. “It could give us a unified sense of place and really, a visual reminder to be proud,” she said. Sponsors pay $5,000 per sub, and the project has secured $65,000 in sponsorships, with one donor sponsoring two subs. Organizers hope to secure the remaining sponsorships by Feb. 29. The Mashantucket-Pequot and Mohegan tribes are among the sponsors, said Groton City Mayor Marian Galbraith. Once all 20 sculptures have a sponsor, Connecticut's Submarine Century would call on artists to submit design ideas to decorate the subs. Sponsors then would be matched with the winning artists. “I think that this is a wonderful opportunity for businesses throughout the community to show their support for the submarine base and how that has impacted their own business and the quality of life here in southeastern Connecticut,” said Tricia Walsh, president of the Greater Mystic Chamber of Commerce and a member of Connecticut's Submarine Century executive committee. “It will just be a great asset to get people excited and moving around and talking about the history of submarines in Groton,” she said. Galbraith said the sub trail offers another way to celebrate the region’s connection to the sub base. Visitors will be able to use the app to find a sub, take their picture with it and share the photo via Connecticut's Submarine Century's Facebook page and the tag #submarineproud. “It will really highlight and heighten in a really fun way that relationship,” Galbraith said. Proceeds from the CT Sub Trail will go to the USS Groton Sail Foundation. The group plans to take custody of the sail, upper rudder and other parts of the USS Groton, which was decommissioned in 1997 and was the third submarine named for Groton. The “sail” of a submarine is the tower-like portion that protrudes from the hull at the center of the ship. Is U.S. manipulating Australia submarine deal?